I am a lesbian/queer white trans woman who’s hard of hearing/deaf, who was raised in a wealthy and hearing family and has lived in the US South for most of my life. I started organizing and connecting with movement work towards the end of high school, joining a local organization called Building Locally to Organize for Community Safety (BLOCS). After moving to college in NC, I was an organizer with a group called All of Us NC (documentary, article) that fought NC’s Amendment One. All of Us NC was a group formed by queer people of color movement leaders, many of whom were connected to the regional organization, Southerners on New Ground (SONG). I came into being a communicator later, as a member of SONG, and then more actively with Solutions Not Punishment Collaborative (SNaP Co) & the Racial Justice Action Center (RJAC) when I moved to back to Atlanta, GA. I also worked with the US Human Rights Network as their Director of Communications, Research, and Evaluation. As a member of SNaP Co & RJAC, I was introduced to generative somatics and became a student of their work & methodology, informing how I think about burnout & sustainability in the movement. Media events and interviews can be powerful points of intervention. SBS helps move from analysis to creativity and imagination. One is a project around thinking about how we address burnout and support sustainability in movements, culminating in two different tools: the online BRB! digital Pivots deck and No Burnout Bingo. The other project was creating a SBS spokesperson training, and in addition to an online workshop with AT Alum, resulted in a new CSS toolbox/worksheet called Storypoints. Explain to us why you are doing this work. For the project around addressing burnout & support sustainability within movement work, I wanted to create tools that help us engage in specific actions or practices that change a movement-wide story where burnout and exhaustion have become a norm. This work changes the story and speaks to the tagline Imagination Builds Power by asking the question "What things do you feel are possible to resist burnout and sustain you work for the long haul?" and offering suggestions that people can do to help change the story of their own lives, even if only a little bit. It requires some imagination to envision our lives and our movements with less burnout, allowing us to show up with more capacity, so we can build power and transform the conditions we live in. As for the Spokesperson workshop, we wanted to develop a CSS version of a spokesperson workshop that was infused with story-based strategy. This work can help change the story by taking a moment — the media event — seeing it as a point of intervention, a chance to practice and use story-based strategy, and having a tool that people can use to develop powerful talking points and tell a story that changes the terms of the debate and reframes it. Share how folks can get involved with your work or see your work’s final product. 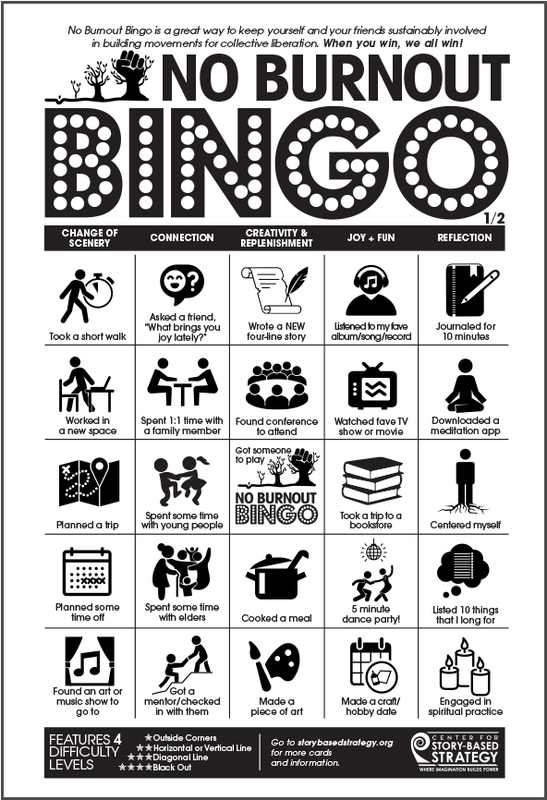 You can download the PDF of No Burnout Bingo. Bookmark the BRB! Digital Card Deck and return to it as you build a practice for self care and preventing burnout. The SBS Spokesperson Workshop material is still in development after our initial training, so materials will be publicly available at a later date. Story-based strategy is a way of understanding that the work to fight injustice & advance movements for change also includes changing the narratives that we hear and tell in a way that allows us to be clear about where harm is coming from, who has the solutions and leadership, and re-imagine what might be possible for our lives, communities, and world. How did SBS affect your work on the project? For the No Burnout Bingo / BRB! Digital Pivots Deck project — we modeled them on Resistance Bingo and the Pivots Decks, respectively. I was thinking a lot about our wellness and lives as a point of intervention; and that the project is an opportunity to interrupt a status quo narrative that says that our lives are supposed to be consumed in the service of racial capitalism or in resistance to it. It works to tell a different story: a story that we get to have full lives. That, in addition to our powerful and transformative movement work we are committed to advancing for the long haul, we also get to have lives with joy and fun; lives that break isolation and foster connection to other people, to land, to spirit and much more. The content in it are all actions, because we have to actually do the things that sustain us. There’s an action logic there. The SBS Spokesperson Workshop & Storypoints worksheets was even more active SBS-wise. The project was thinking about how to use a set of SBS tools as practitioners. The tools in the Storypoints worksheets were largely pulled from the CSS’ new Rapid Prototyping tool, but slightly shifted (Cornerstones, BOS, Drama Triangles, Top 2 Underlying Assumptions, & F.R.A.M.E.S). Part of how we finalized them was reverse engineering the video of Terry Oliver and imagining how she might have filled out the Storypoints worksheet & used SBS tools to get to her talking points. When I’m not using SBS, I can find myself really analytical, wrapped up in a perfectionism that can be rigid and self-defeating. Using SBS tools, theory, and praxis for these projects made me more creative, in addition to being analytical, and helped me move from a place of imagination and what might be possible. For the BRB! Deck & No Burnout Bingo, I would have wanted to prototype it out with other folks to get feedback and improve the deck if needed. I would have wanted to also reach out to organizations and leaders doing work around healing & sustainability in social justice work as well as politicized healing projects like the Healing Justice Podcast for ways to amplify the tools and increase the reach as well as incorporating more of them into the deck. For the SBS Spokesperson Workshop, I would have loved to also develop a version of it that made the workshop more accessible to organizers & communicators who aren’t AT Alum & SBS practitioners. I would have also loved to have ‘reversed engineered’ other moments to have more examples in addition to Terry Oliver’s interview. And maybe if there are participants who went on to use the Storypoints worksheet, in a future workshop, looking at that as an example, and think about ways to strengthen it even further, almost like a virtual Sandbox space. We'll be sorting all this out as we finish developing the tool. Absolutely. It will change how I relate to work in the future, I feel like I can show up with more competence and skill in story-based strategy and as a practitioner in future work. SBS reminds me of the power of creativity and the impact that it has when I make room for it in my work with other folks. It pushes me to show up with curiosity and a willingness to trust in ourselves and the process while bringing to the table our experience, skill, and political commitments, and will continue to push me to do so. Part of the reason why is that I see SBS as a set of skills we can grow and develop competence in as well as it’s something that, with some prep work and support, can be a process most people I work with can participate in. It feels like this powerful toolbox, lens to view the work & the world, and sets of practices that gets more powerful the more we do it, especially so when it’s used and developed in collaboration with other people. SBS creates a space for geeking out in the service of developing and advancing strategy to transform the world.